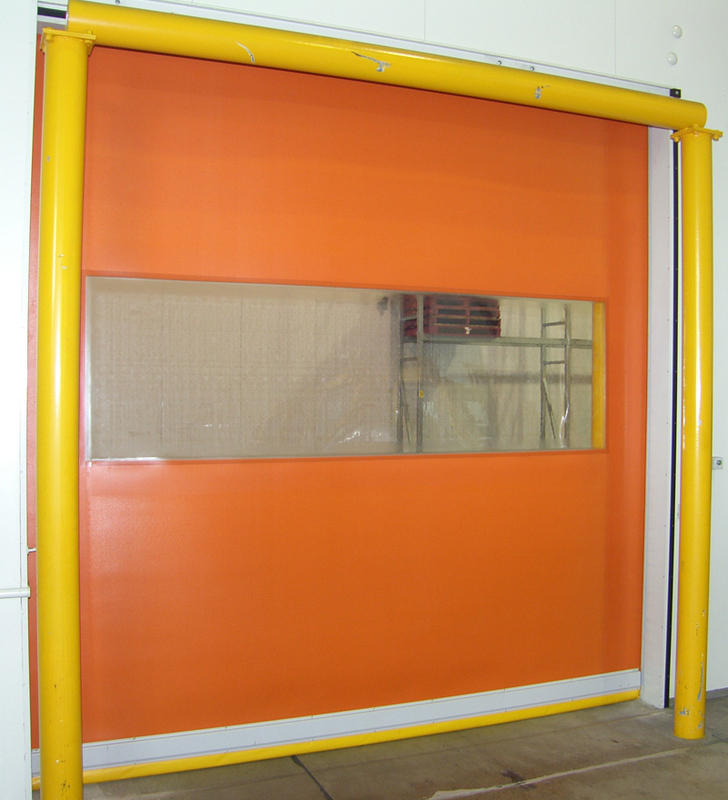 Cost of ownership is significantly reduced due to the simple design and operation of our door. 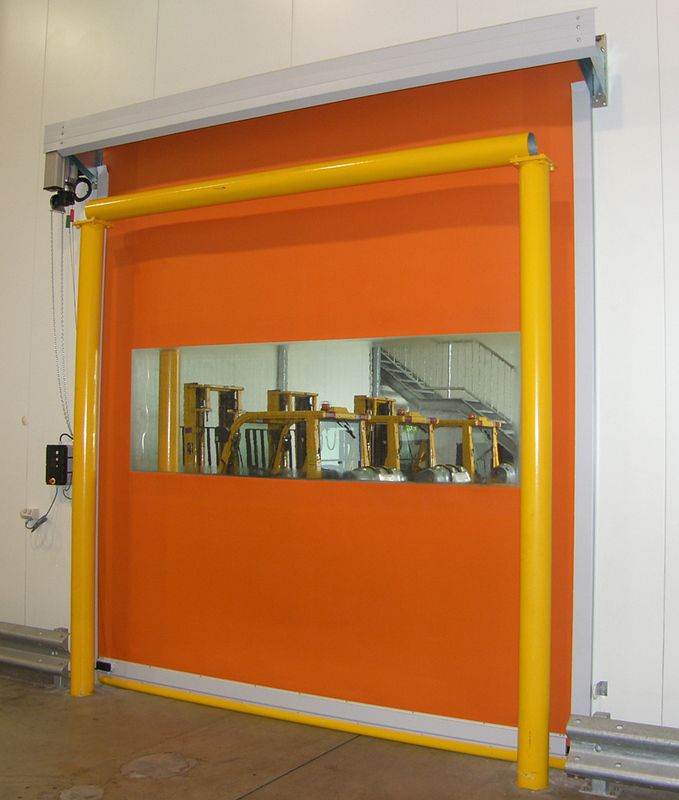 The use of the GFA’s Heavy Duty drive system means that RAPIDMAX® does not require any springs, pulleys or cables to balance the door, less moving parts means significantly reduced maintenance costs. RAPIDMAX® is manufactured using heavy duty galvanised steel throughout its entire frame structure. 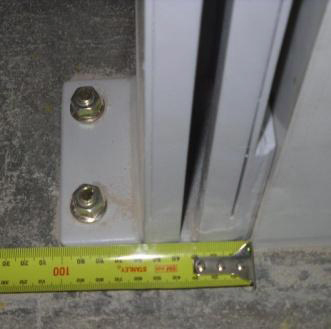 Our side guides are manufactured using roll formed galvanised steel with welded top and bottom plates and are extremely compact measuring only 100mm x 45mm and can be customised to fit smaller footprints where necessary. Welded wind locks ensureRAPIDMAX® can withstand high wind pressures and gusts. The top roll supporting the door curtain is galvanised steel rolled tube supported by double disc welded high tolerance shafts. Our bottom beam is made using pressed galvanised steel; the strength of steel combined with our simple and effective ‘break-out’ end guide tabs allow the bottom beam to be hit and “knock-out” without serious damage and simple repair. Optional extra – powdercoated surface (DULUX colour range). TOUGHFLEX® is 2mm thick, manufactured using a double layered polyester-linen woven material and triple coated with a specialised PVC compound, this material is extremely tough and durable. TOUGHFLEX® has been specifically designed for the Food Manufacturing Environment, it has been certified and conforms to US FDA standards making it safe to use in all Food Manufacturing and Food Distribution environments. The material also provides anti-static properties and has a working temperature range between -24⁰C and +70⁰C making TOUGHFLEX® a flexible but tough barrier to almost every environment. Colour variants available – red, orange, blue, green and off-white. 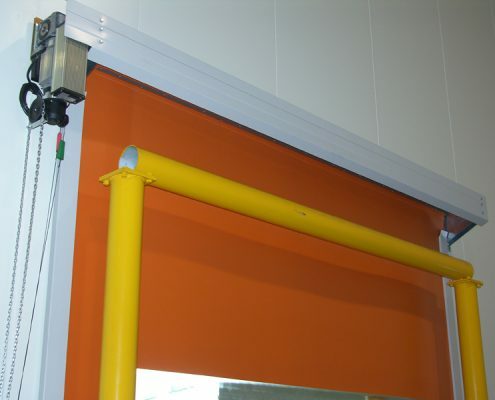 TOUGHFLEX® is warranted for a period of 5 years (no vision) or 3 years with vision panels/windows. Max Door Solutions use complete GFA drive systems on all RAPIDMAX® Doors, GFA drive systems are a complete package and purpose built for High Speed Door applications. GFA are a German based company and have been in the market for 58 years, they sell around 150,000 drive systems per annum which position them as the largest door operator manufacturer in Europe. GFA’s commitment to quality and innovative design support Max Door Solutions design criteria of Strength, Durability and Simple Operation. All GFA drive systems are designed and manufactured in Germany and supported by a locally based sales and technical team including stocked spare parts. Every RAPIDMAX® High Speed Door is fitted with a state of the art GFA integrated variable speed drive and gearbox and operated through a standardised Control Panel which are available to suit both single (240v) and 3 Phase (415v) power sources. This operator is fitted standard with digital limits with absolute encoder, after power failure no re-adjustment is required as the encoder memory is independant of constant power supply. The GFA Control Panel is designed with simple operation in mind, each door is supplied with an easy to understand operation manual and troubleshooting guide which directly relate to the LED display positioned on the front of the control panel. 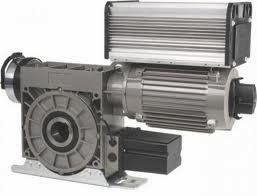 All GFA drive systems conform to DIN EN 12453 (control panel) and DIN EN 12604/12605 (safety brake) and are IP65 rated. RAPIDMAX® operating speeds are customised to suit each individual application. We currently offer a maximum opening speed of 3.2mtr/sec which allows traffic to move efficiently between rooms while maintaining environments, closing speeds are normally set at around 0.8mtr/sec. 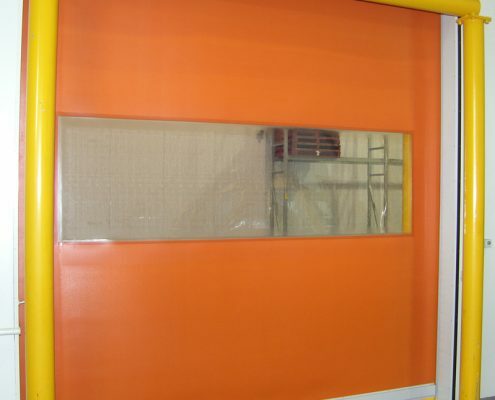 RAPIDMAX® doors are currently manufactured to a maximum dimension of 22.5m², this translates to 4500mm wide x 5000mm high customised doorways outside these dimensions can be accommodated on application. RAPIDMAX® doors offer incredibly tight total door clearance dimensions. This feature provides a significant cost saving in relation to installations in existing buildings, a smaller footprint means less impact to existing fixtures or the need to rework doorways. RAPIDMAX® standard configuration is capable of withstanding wind gusts of up to 20klm/hr (Class 0), with the addition of curtain wind locks RAPIDMAX® can withstand gusts of up to 72klm/hr (Class 1). Optional extra – curtain wind locks. 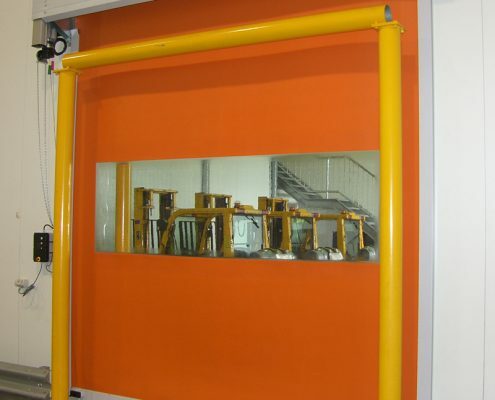 Safety is a critical design feature of the RAPIDMAX® High Speed Door; each door is fitted with a range of safety features as standard to ensure personnel are protected. Standard safety features include “Soft Touch” Bottom Beam Reversing Safety Edge, Door-line Optical Safety Beam (reflective) and Control Panel mounted Emergency Stop Button. Another standard feature is the manual crank override; this allows manual operation of the door in the event of power failure. A standard activation feature of every RAPIDMAX® Door is a push button panel integrated within the GFA Control Panel, fitted on the other side of the doorway a wall mounted, single push button. Additional activation methods are listed below in the optional extras section. Optional extra – floor loop vehicle detection, remote control, radar vehicle/personnel detection system, transponder system, “touchless” button, security pad, lockable key switch, Uninterrupted Power Supply (UPS) package. Powdercoated Surface (DULUX colour range).